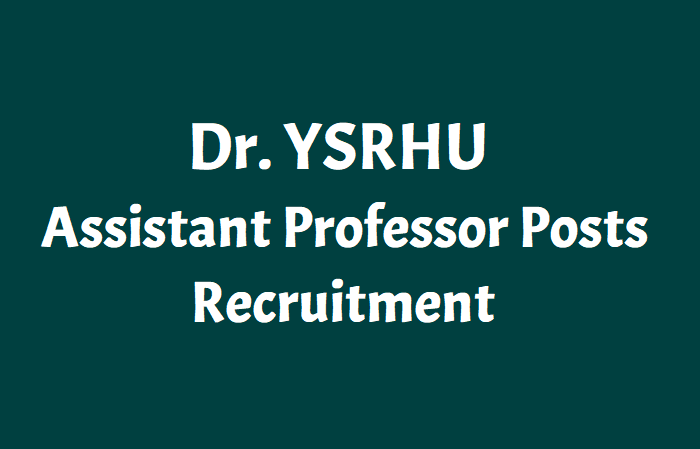 Dr. YSRHU Assistant Professor Posts Recruitment and Last date is 17.12.2018. Dr.Y.S.R. Horticultural University, Venkataramannagudem has issued the Assistant Professors recruitment and invites applications for the posts of Assistant Professor in YSRH University. Qualifications: Candidates must have Bachelors/ Masters degree (relevant discipline) with NET qualification. How to apply: Filled applications along with required documents, registration fee Rs.1250 in favour of Comptroller, Dr.YSR Horticultural University, Venkataramannagudem should reach The Registrar, Dr.YSR Horticultural University, Venkataramannagudem, West Godavari District, Andhra Pradesh on or before 17.12.2018. All other information pertaining to number of vacancies in various disciplines, rule of reservation, qualification, registration fee, general and other information is available in university website www.drysrhu.edu.in.